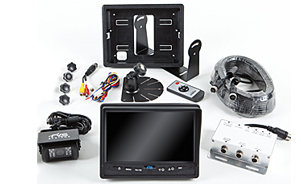 Mickey Truck Bodies has added a backup camera system complete with crystal clear 7” LCD digital color monitor with mirror image capability – to its long list of popular options. Beginning January 1, 2014 all new Mickey beverage bodies and trailers will be pre-wired as a standard feature to accept the system so that customers who do not purchase the option with a new unit can have it easily installed after market. System connects up to 3 cameras and is weather proof. The backup camera system, which is being supplied by Brooklyn, NY-based RVS SYSTEMS, a leading manufacturer of rear view camera systems, can connect up to 3 cameras and is completely weather-proof with an IP68 rating. The unit is strong and reliable, shock resistant with a 20G impact rating, and comes with a 2-year warrantee.